The climate is the result of the combination of processes of natural and anthropogenic processes that interact together. The climate of the future will continue to be conditioned by global atmospheric circulation which will result from the evolution of the radiative forcing imposed by the future atmospheric contents of greenhouse gases and aerosols. The simple extrapolation of the current trend would suppose a perpetuation of the socio-economics global trends currently observed. We now know that this is not realistic and we cannot predict the direction that these developments will take in the medium and long term. There is a large number of provisional scenarios in which respective plausibilities and probabilities are far from being confirmed, particularly because of uncertainties on the policies of some countries in terms of the reduction of emissions. Climate models constitute the basic tool for making projections about the future. The most advanced models describe atmospheric and oceanic circulation, surface processes, the evolution of icebergs and the cryosphere, the carbon cycle and the influence of the physico-chemical composition of the atmosphere (greenhouse gases, aerosols). They take account of the interactions between the various components in the climatic system, for example between oceans and atmosphere, and between the land, vegetation and atmosphere. The general circulation models (GCM) coupled with the ocean and ice bank can still be improved. Moreover, even though the predictions on global temperature are generally consensual, disparities exist in the behaviour of the hydrological cycle as to regional responses to the increase in atmospheric greenhouse gas content. 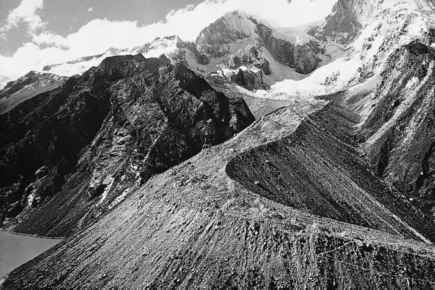 Finally, questions remain on the response of our natural environment to global warming. For example, land use changes (particularly the natural or cultivated vegetation), the storage of carbon (particularly in the ocean and in the continental biosphere), or possible modifications in oceanic circulation would all change the response of the natural environment. When we consider the impact of a climatic change on agriculture and forestry, in a particular country or a continent, it is clear that we must work at a suitable spatial scale. Such a scale would generally be more detailed than the current horizontal resolution of the general circulation models (having a grid in the order of 200 km). Research on the regionalisation of climatic changes (Wilby et al., 2000) ought to be carried out, which focus on improving the techniques themselves but also on the evaluation of their impact on agriculture and the environment. Two techniques, based on the modelling, are now used to study the regionalisation of climatic impact (Gibelin and Deque, 2001). The first consists in using nested models. We take an atmospheric model, the scope of which covers only the region being studied (Europe, for example): this model is called the regional model. Hour by hour, we impose on its boundaries the meteorological conditions calculated by a global model with a coarser resolution. This method has already been used by numerous countries (e.g. the U.S.A., Great Britain and Germany). The methodological disadvantage comes from what happens at the boundaries of the area. There is no feedback between the global Circulation Models and the parameters (winds, temperatures, etc.) calculated by the regional model. We may therefore be led to link a depression calculated by the regional model to an anticyclone calculated by the global model. To correct this error, we can extend the boundaries far outside the area under consideration. The second method consists of using a model with a variable grid, which allows us to zoom in on the area of interest or, to use a restricted area to curb the complementary model. The implementation of such models is now possible thanks to the power of supercomputers. This latter method seems the most promising and is used by Meteo-France with the Arpege-Climate model in its stretched grid version aimed at the region under consideration (Deque and Piedelievre, 1995). This numerical model, which arises from the operational meteorological forecasting model, covers the planet with a more detailed horizontal resolution (60 km) in France than in the South Pacific (450 km) as shown in Figure 4. Figure 4. Horizontal grid of the Arpege-Climate model in which the focal point is placed in the Mediterranean (between Italy and Sardinia). 3.3. WHAT DO MODELS SAY ABOUT REGIONAL CLIMATE CHANGE? There is no doubt about a warming impact, in global mean, in response to the expected anthropogenic change. The uncertainty is about the amplitude of the warming and its geographical distribution. IPCC (2001) provides an interval between 1K and 5K for the end of the 21st century. The primary source of uncertainty is the anthropogenic input. Several scenarios have been proposed by IPCC, from the most optimistic to the most pessimistic. The scenario studied here is labeled B2 by IPCC. It corresponds to a modest reduction policy in the emissions, leading to a double CO2 concentration with respect to preindustrial values by the end of the 21st century: we are much below the 1% per year concentration increase used in the previous scenarios (Giorgi et al., 1992). The global temperature response to this forcing is about 2K amongst the GCMs (it is 1.8 K with Meteo-France model). This warming is not uniform and some models like ARPEGE predict a cooling in the mid-Atlantic in winter due to the change in the thermo-haline ocean circulation. A warmer atmosphere should contain more water, so that the precipitation-evaporation cycle is expected to be enhanced. However, the GCMs do not predict a rainfall increase over all regions, but positive and negative precipitation anomalies spread over the globe. There is a consensus, however, about an increase over most tropical regions. In Europe, the consensus in the global as well as regional models is an increase in winter in the northern part and a decrease in summer in the southern part (Mediterranean basin). 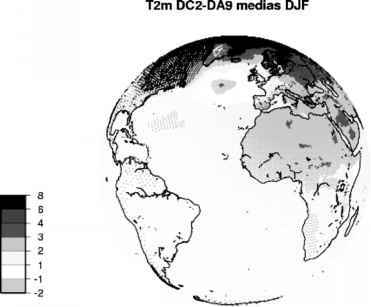 Figure 5 shows the impact of the B2 scenario in winter (December, January, February) for temperature and precipitation over the western hemisphere (Figure 5 a and b) and a zoom over Europe (Figure 5c and d). The precipitation decrease over the Mediterranean basin is also found by Timbal et al. 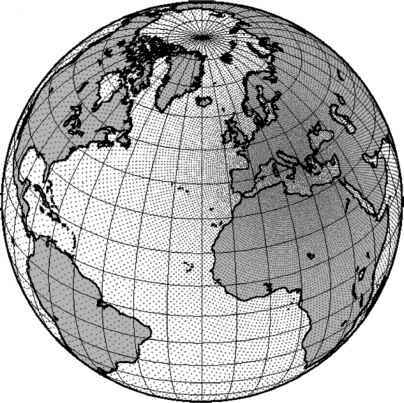 (1995), but other models (e.g. 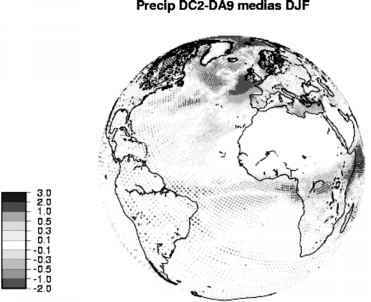 Giorgi et al., 1992) predict a precipitation increase over the whole Europe. Over northern Europe, most regional (limited area) models predict warmer and moister conditions (Christensen et al., 2001). Figure 5. (a) and (b): Impact of the B2 scenario by Arpege-Climat in winter for temperature (a) and precipitation (b) over the western hemisphere. (c) and (d): Anomalies in average temperature (on the left in °C) and precipitation (on the right in mm/days) forecasts for the end of the twenty-first century using the IPCC B2 scenario and the Arpege-Climate model in the stretched/ aimed version. for rainfall or wind speed) and exceeded threshold values (the case of frost or shrivelling). • The duration of the period simulated using a climatic model subject to a defined scenario. If we consider the average zonal atmospheric response to the doubling of the concentration of CO2, a simulation over a single year is sufficient. If we wish to consider the interannual variability of a parameter in the course of a season in a given region, a simulation over ten years is necessary. If we wish to study the variability of the precipitation regime, at least 30 years are necessary (Deque, 2000). To provide a concrete illustration of this thesis, consider that an average reduction in precipitation of 10% in the course of a single summer will not be too damaging to vegetation if it is regularly reproduced each year. But, if this average value of 10% corresponds to a decrease by 50% which may occur once every five years, the damage to the biosphere could be higher, or even irreversible. In studying the impact of climatic change on agriculture and forestry, it is therefore essential to have an extended series of simulated meteorological data. Thus, for example, Meteo-France has put together a simulation of 140 years on the ARPEGE-Climate model using the IPCC B2 scenario.